It has been a while since our last posting. So, bear with us. We have covered a lot of miles since Rayburn COE in East Texas. You might want to skim through or skip sections, or just see the pictures. 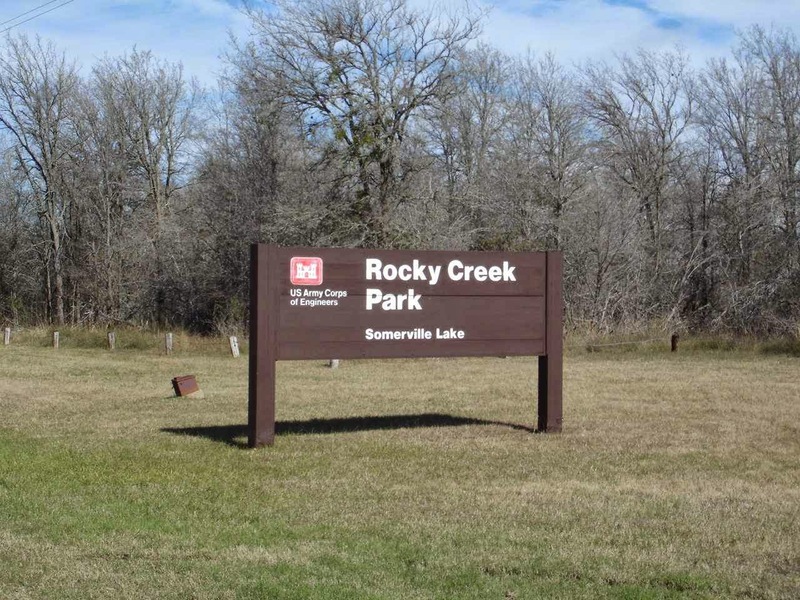 Jan and I finished all of our Livingston, Tx business by December 28 and headed west to Rocky Creek Corps of Engineer park at Somerville Lake. Very wet and cold. We were quite comfortable, but felt a little sorry for families trying to enjoy some holiday vacation time with kids. Not the best family camping weather. Rocky Creek is very close to Bryan and College Station, home of Texas A and M. Lots of sports talk on the local channels. Very much entertained by a large herd of deer in the park. Pretty relaxing to watch the weather over Somerville Lake as well as the deer. A lot of migrating birds . If you enlarge the picture(by clicking on it), you will note a pelican or two as well as the ducks. Yes, that black line in the water is a giant flock of birds. It seems these little squawking birds never stop. 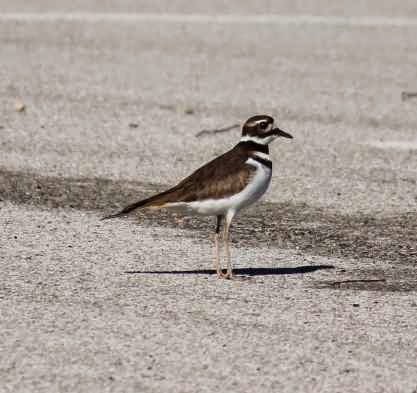 And , yes, they are a plover. Lady Blue is happy to be by the lake, even in the rain. 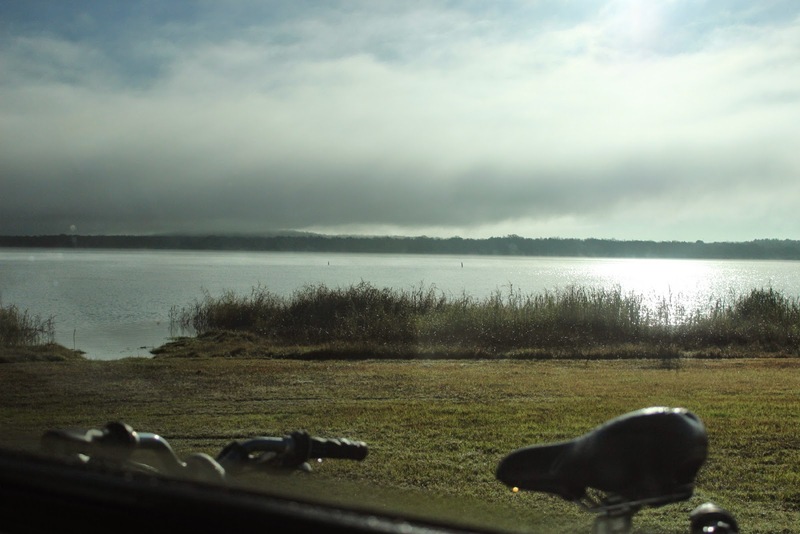 The next move takes us into more open land of west central Texas. 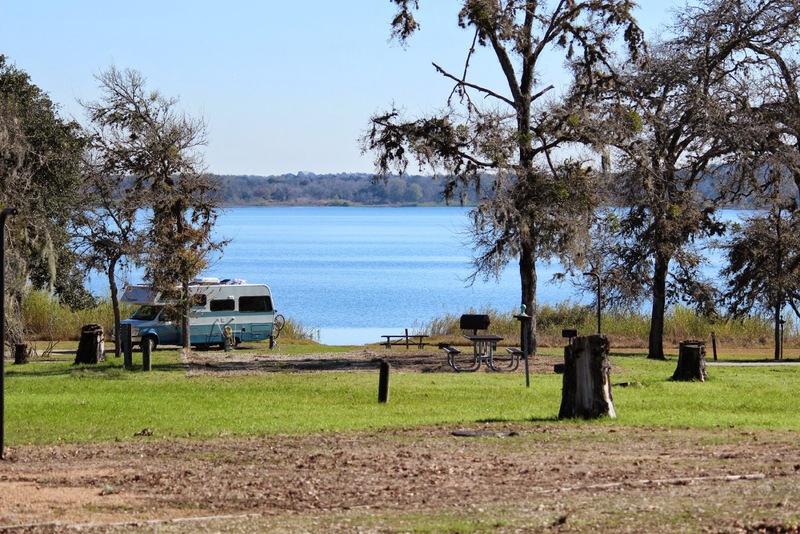 Another favorite Corps park, this is Potter's Creek at Canyon Lake. Very close to San Antonio. 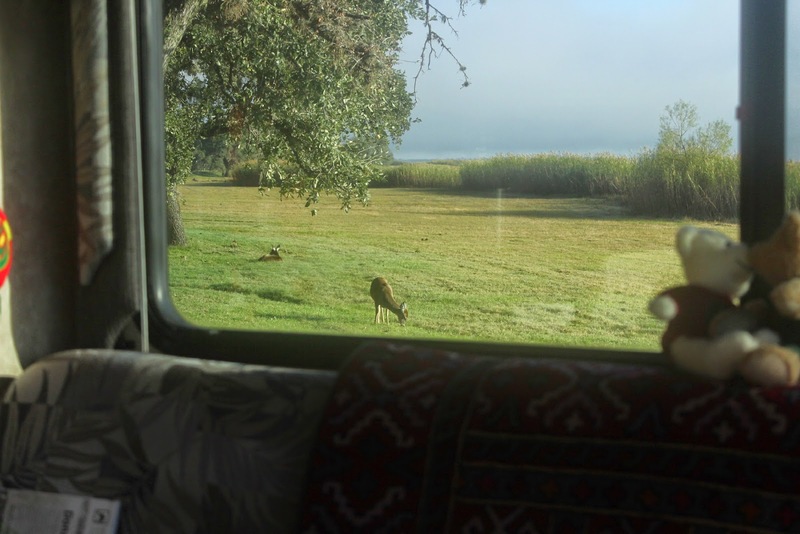 And we notice a number of Snow Bird RVers from Minnesota, Iowa, Ohio,and Wisconsin. Those that wish, can manage to stay at this park all winter. 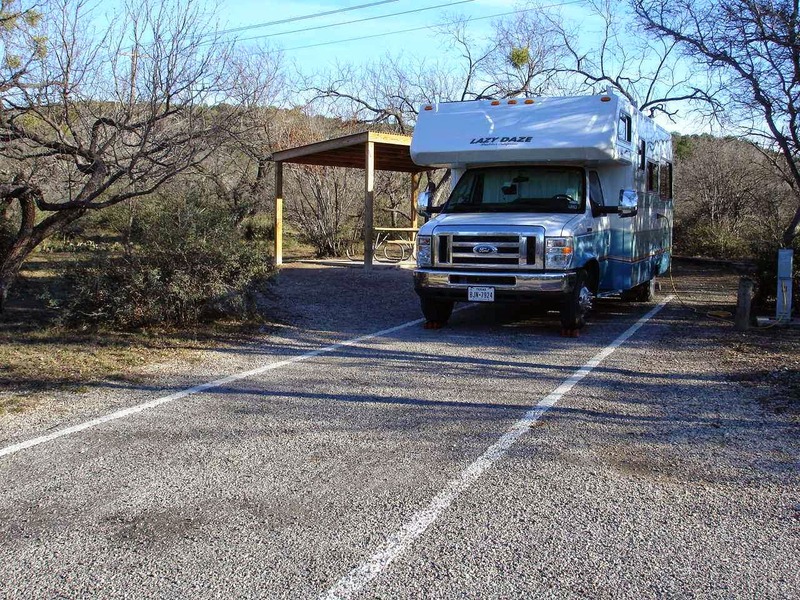 Potter's Creek is very close to San Antonio, San Marcos, LBJ's Ranch and museum in Johnson City, and Fredericksburg. 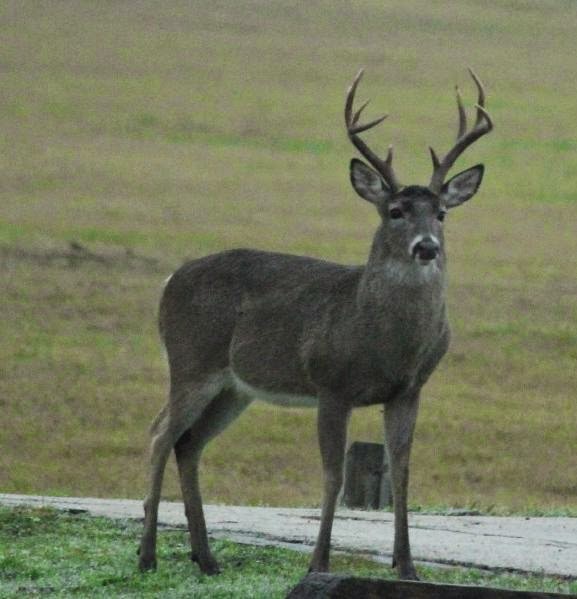 Potter's Creek also has a large herd of deer. We notice , however, that many of these are fed by the campers. 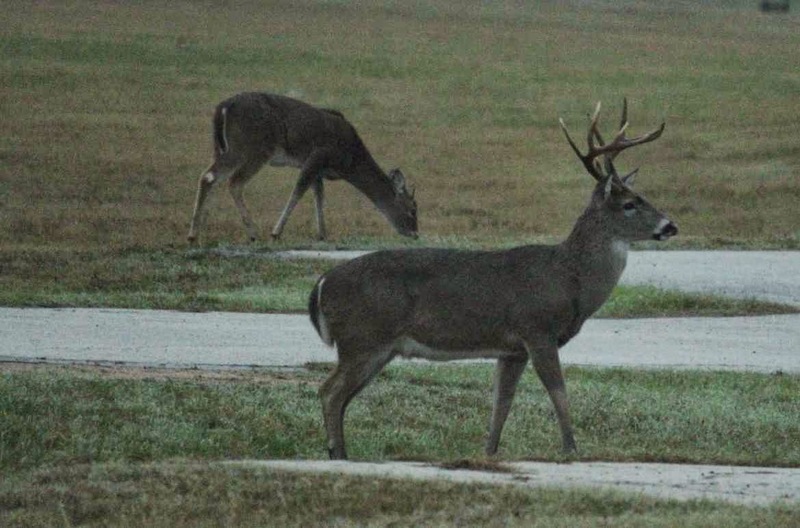 The above is one of many bucks we saw in the campground. 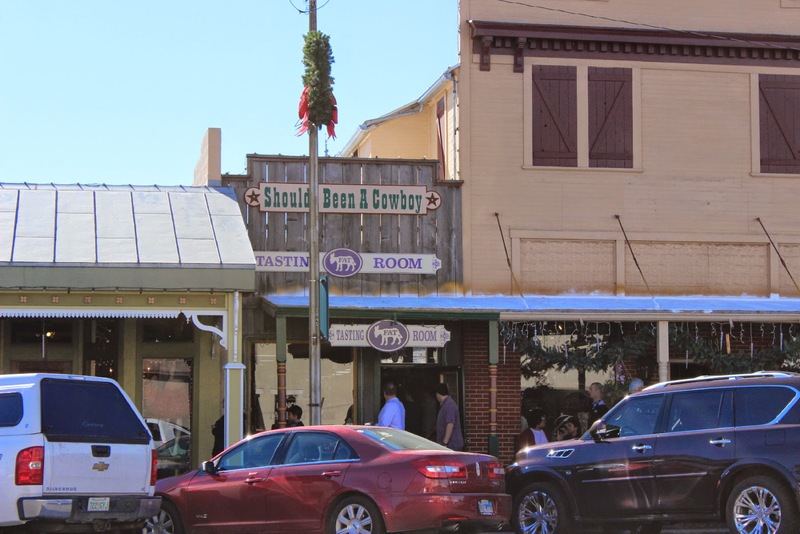 A short ride take us to Fredericksburg, one of our favorite U.S. towns. 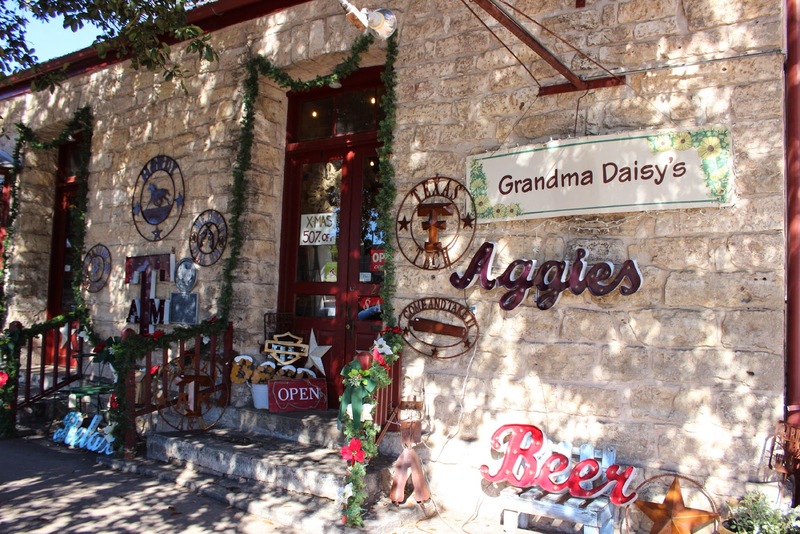 Settled by Germans in the 1800's , this town keeps its heritage up front for the shoppers and tourists. 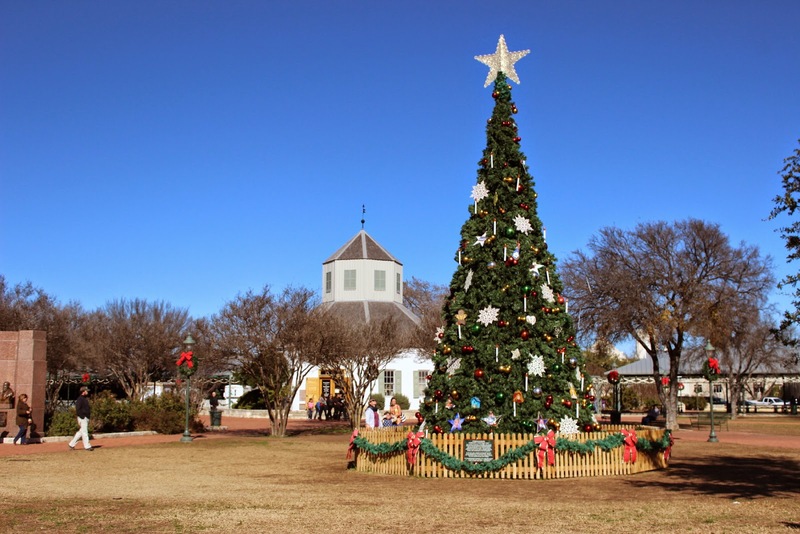 The round building is a replica of the original 1847 kirche -church and meeting house on the market square. 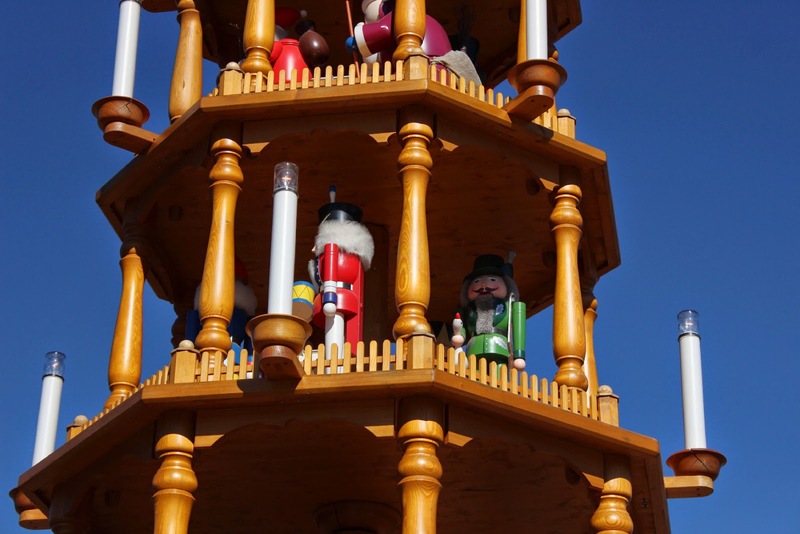 This Christmas Pyramid was handcrafted in Germany and dedicated here in 2009. A giant example of a small wooden one that Jan had back at our stick house. A gift. Do you remember, Sean? Always enjoyed lighting the candles and watching the vane on top and the figures go 'round. A lot of attention to detail for such a large piece. 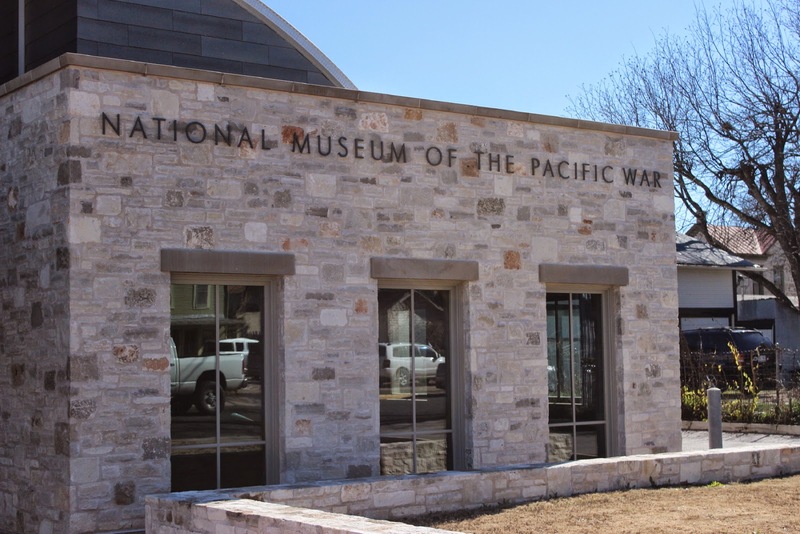 The boyhood town of Fleet Admiral Chester W. Nimitz, Commander in Chief of the Pacific Fleet during World War II. The town has a wide range of stores in the main street area. 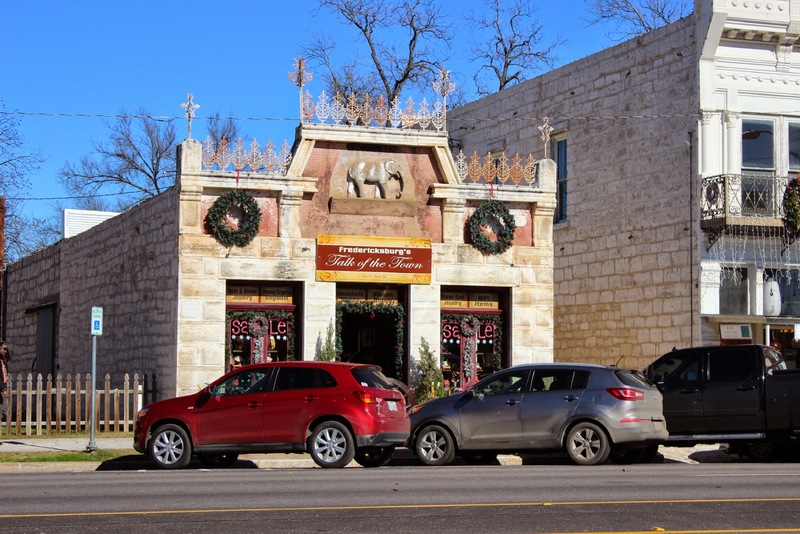 Yes, the store is called " Shoulda Been A Cowboy"
One of many "tasting rooms" to sample many of the local Texas wines. Some of this development is fairly recent and you see a lot of vineyards on the roads into Fredericksburg. Some are standard wines like cabernet and others are fruit wines like peach, etc. 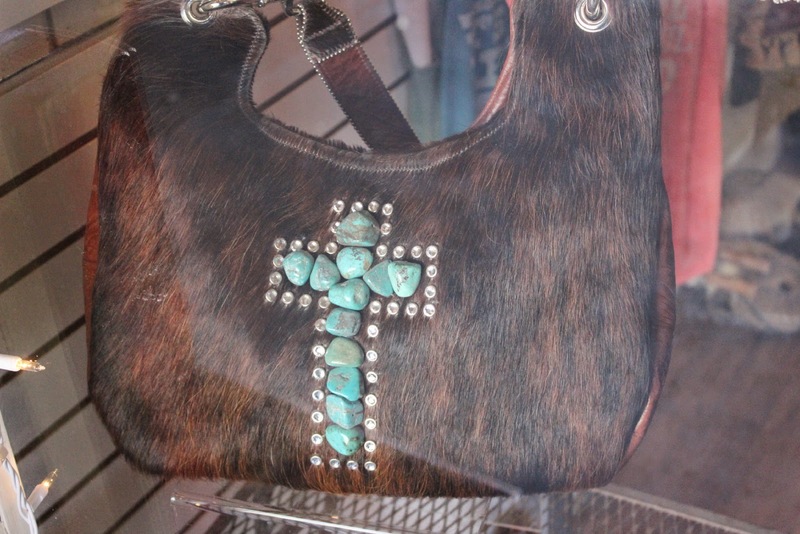 Where else can you find such a pocketbook? 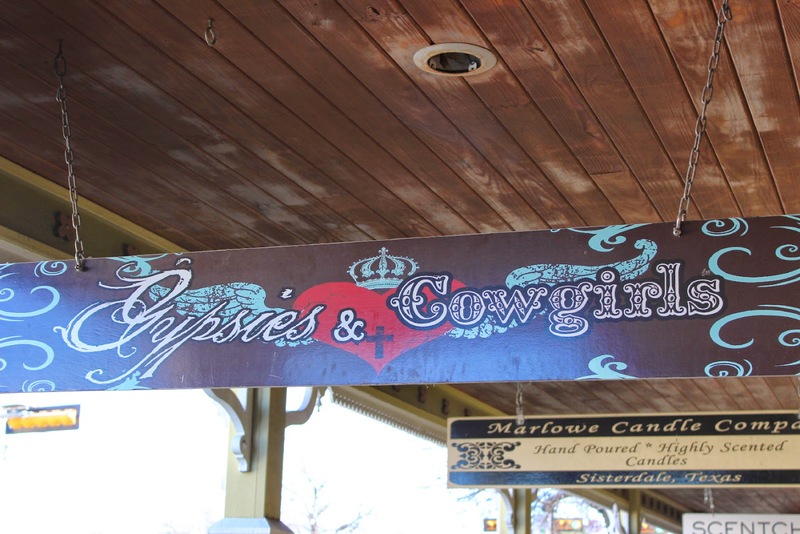 Other stores have many selections of cowboy boots, hats, and other clothing. Lots of restaurants, including barbeque and German. Had to have a real German Reuben sandwich. Many of the buildings are of a unique design and made from stone. There are also a number of small buildings that were Sunday houses. These were houses that were built by ranchers in town so they could come in on weekends for business meetings and church. During the week, of course, they lived at their ranch which could be a number of miles away. Paying close attention? Right. This picture is not from January, but from April. 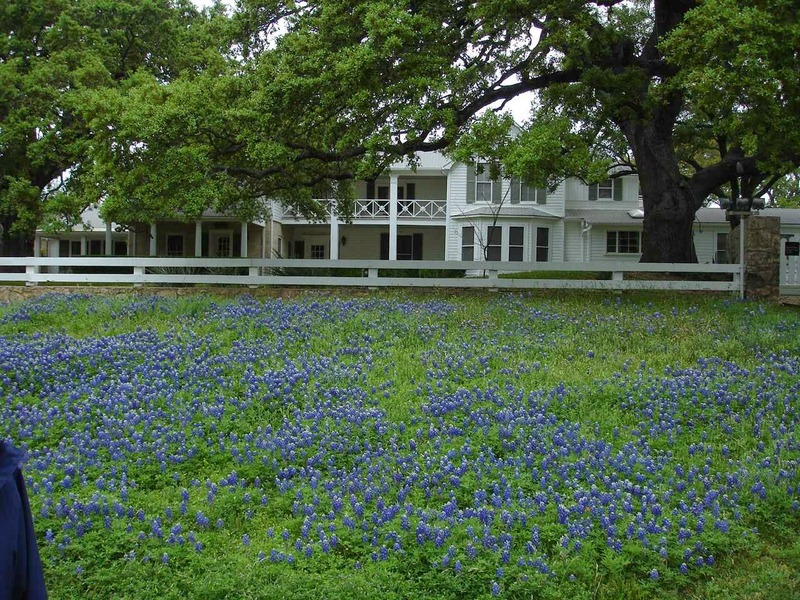 This time from April of 2010 on a trip with friends through the Hill Country with plenty of Texas Bluebonnets. The reason for these two pictures are to let you know how wonderful the Fredericksburg area and Hill Country are in the spring. This is Jan in April 2010 at the Wildseed Farms just east of Fredericksburg on Route 290. 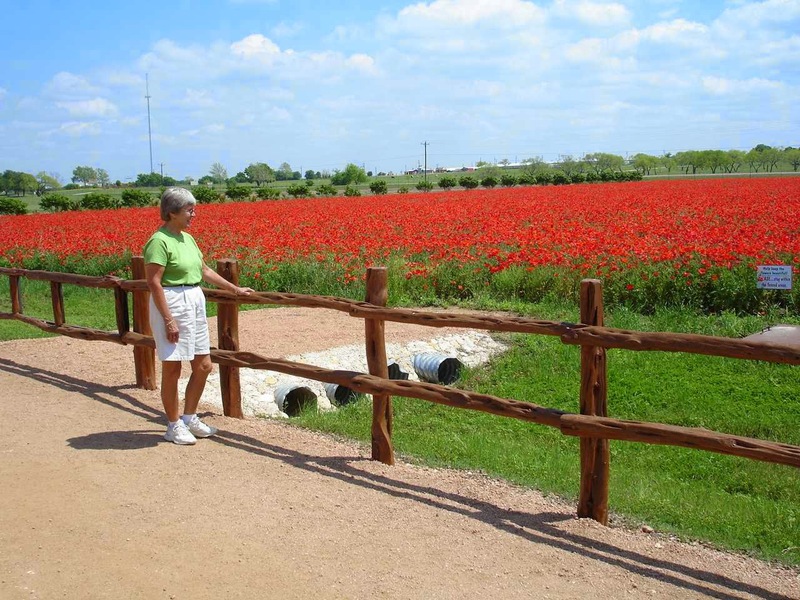 The following link to their webpage has a lot of information about their seed company and the 1,000 acres they maintain in Texas, and pictures of their flowers and procedures. They are open year round. And again we move on. 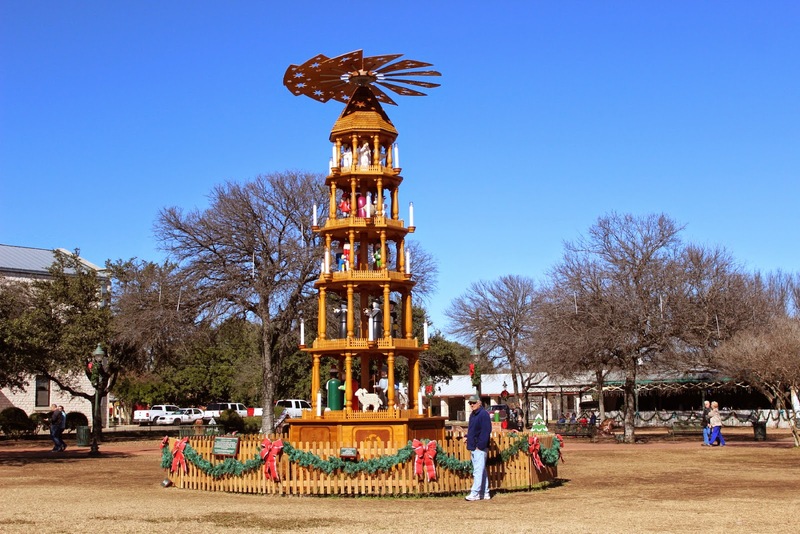 After Fredericksburg, Texas gets much drier. 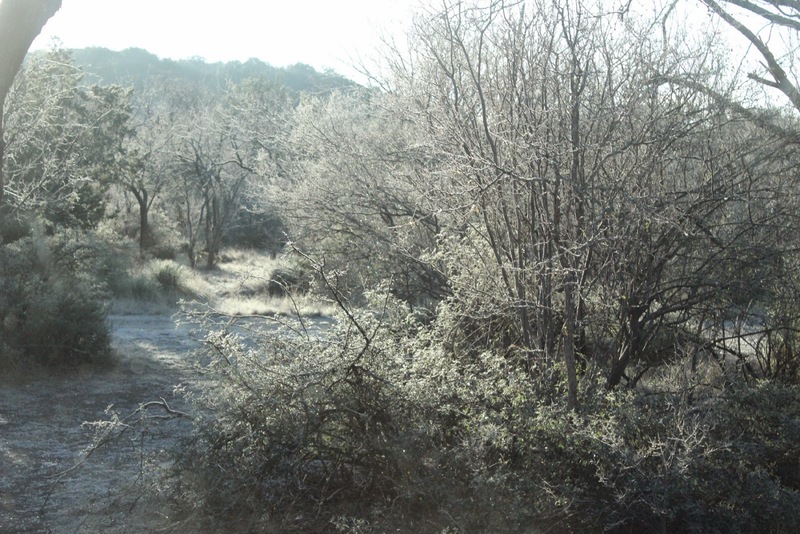 We move into a land of more cactus and fewer to no oak trees. 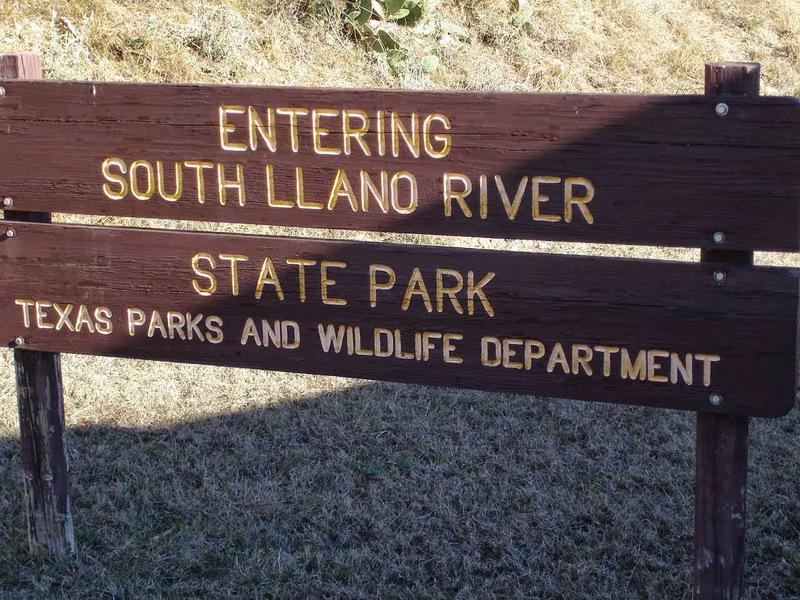 At Junction , Texas, we stop at South LLano River State Park. Nice , long sites in the woods. Part of the park is a refuge for the Rio Grande turkey. They live in a small band of 400 miles from Tampico, Mexico to northern Kansas. 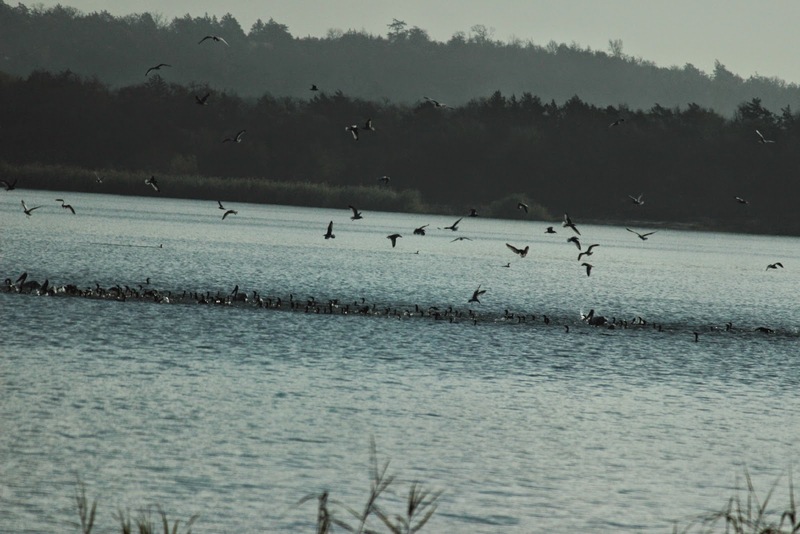 During the winter months, this park might roost up to 800 birds at night. 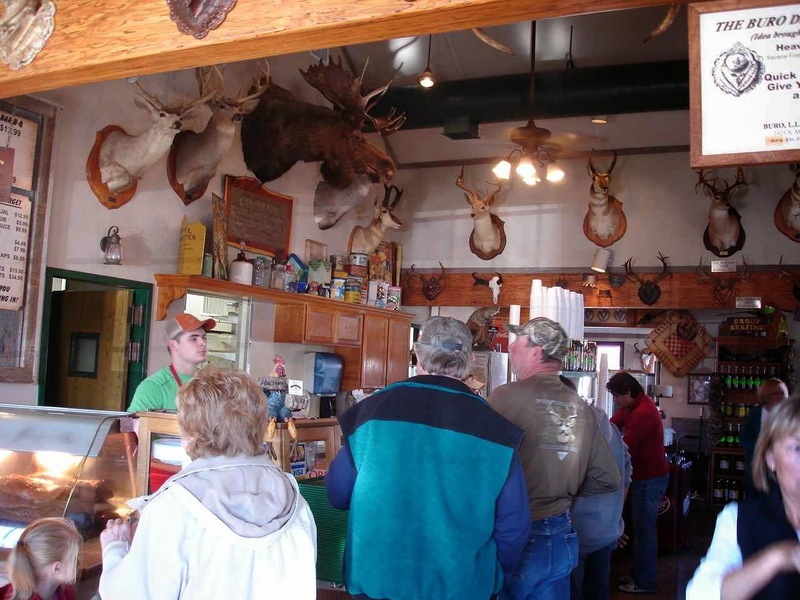 They also had , besides the mule deer, some larger deer called Axis Deer. This picture is from the web. We saw a herd of them twice, but they are very shy and fast--no chance for a picture. They are larger animals and quite impressive with the spots. 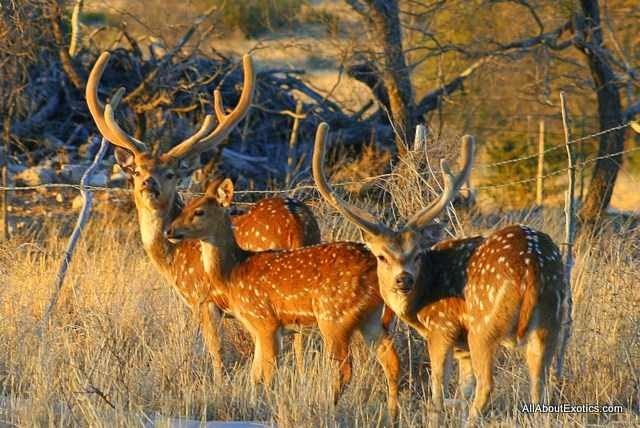 We were told that they are kept on ranches for hunting--no hunting restrictions--and they are a good tasting meat--not gamey. A view from Lady Blue. While many of you were experiencing some cold, we also shared a little of that Polar air. This particular morning ,with that nice frost outside, was all of 15 degrees. Lady Blue stayed toasty, but we had to be sure the doors and pantry stay open to keep the lines from freezing. 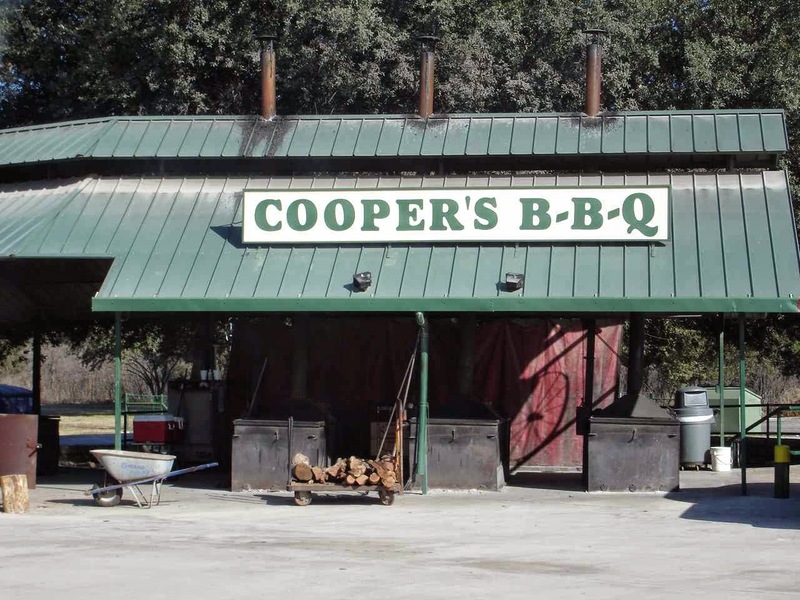 A nice thing about Llano is that it is so close to Cooper's BBQ in Junction. 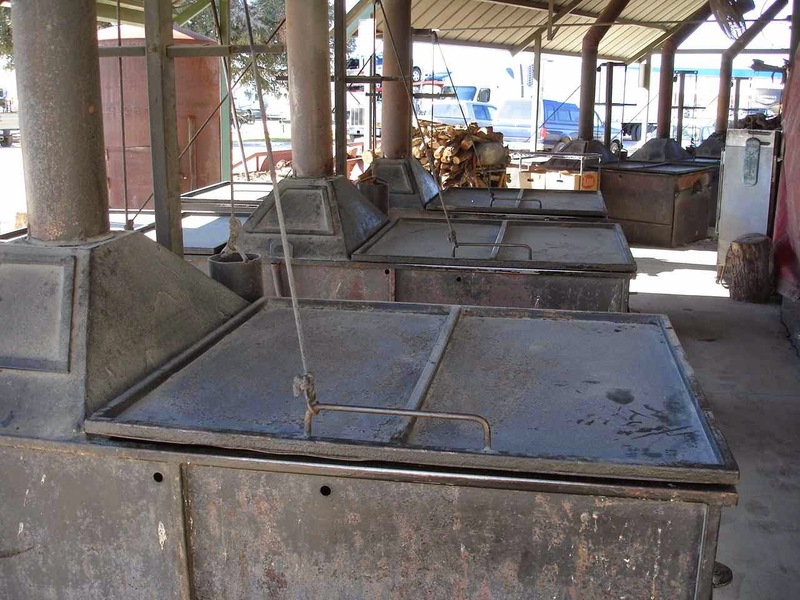 Outside, the cookers are lined up with stacks of wood and a big furnace to keep the old coals. Inside, a long line on a very busy Sunday at about 3:30 in the afternoon. 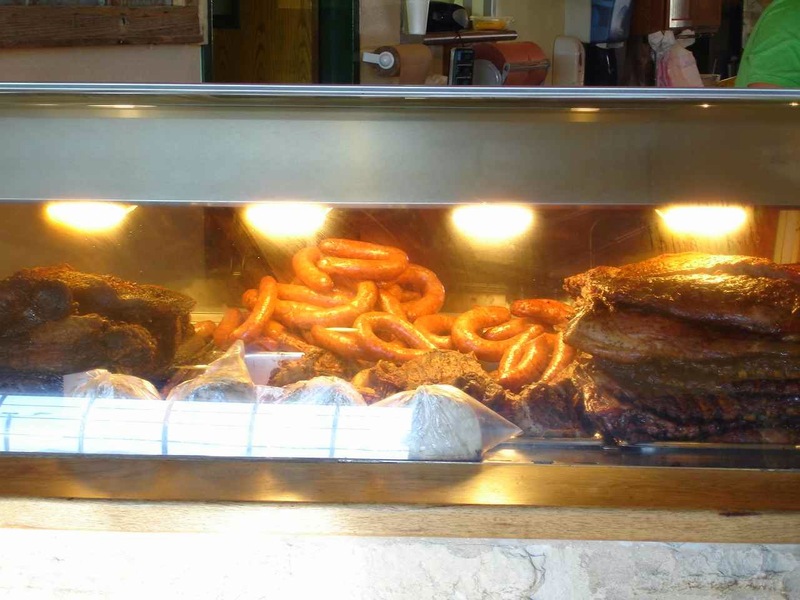 The gentleman behind the counter is the carver who gives you your choice of ribs, brisket,their own sausage, half chicken , or a mix. At the end is their own peach cobbler. What we can not duplicate for you is the delicious aroma as you walk in. Needless to say we tried our best to support them in their efforts. Still heading west on that Route 10 interstate. That is the one in west Texas where the speed limit is a hearty 80 miles per hour. 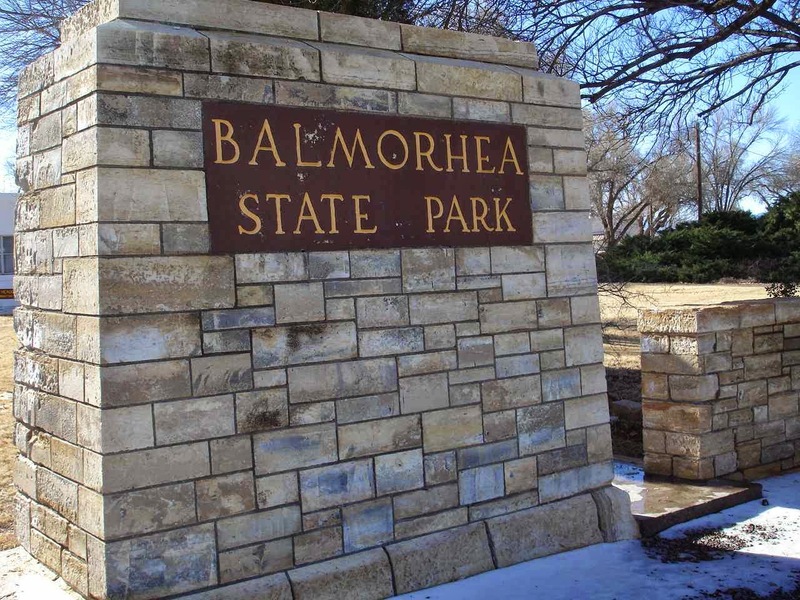 Balmorhea State Park is about where Route 20 and Route 10 join and where here, or earlier out of Fort Stockton , you might head south to Big Bend National Park. A nice park that has grown around hot springs that feed in from the surrounding mountains. The pool that Jan is at is fed by the springs at the rate of 15 million gallons per day. The temperature is 72 to 76 degrees year round. This large pool is over 20 feet deep in places, has a rock and sand bottom, and a very steady flow in and out through canals that lead on to irrigation for farming. 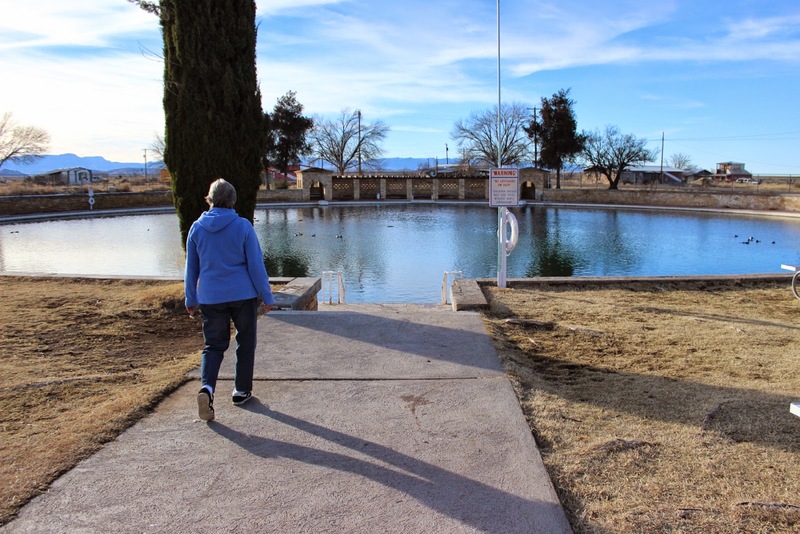 From Balmorhea, it is a bit of a ride to El Paso, the borderland, and on into New Mexico. 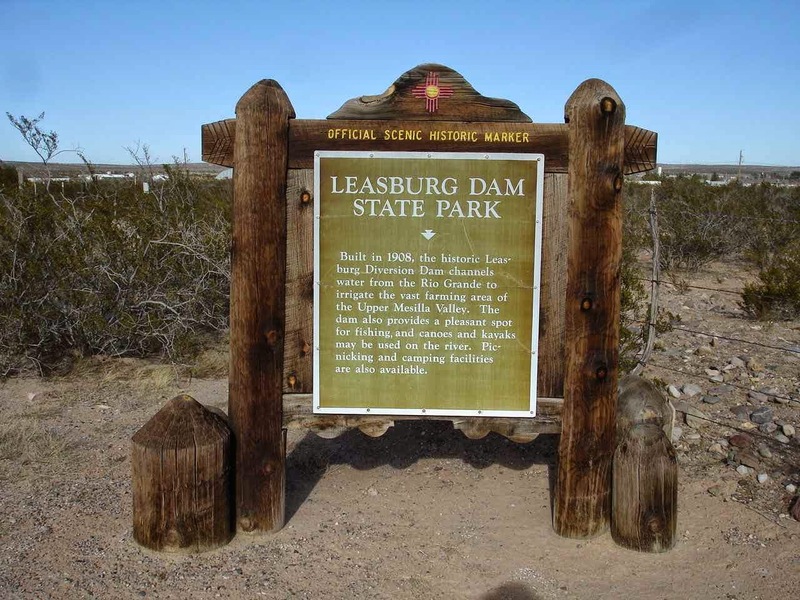 A little ways up route 25 brings us to Leasburg Dam State Park. This is a very comfortable park just out of Las Cruces, along the Rio Grande, and not far from Hatch, the chile pepper capital of the world. 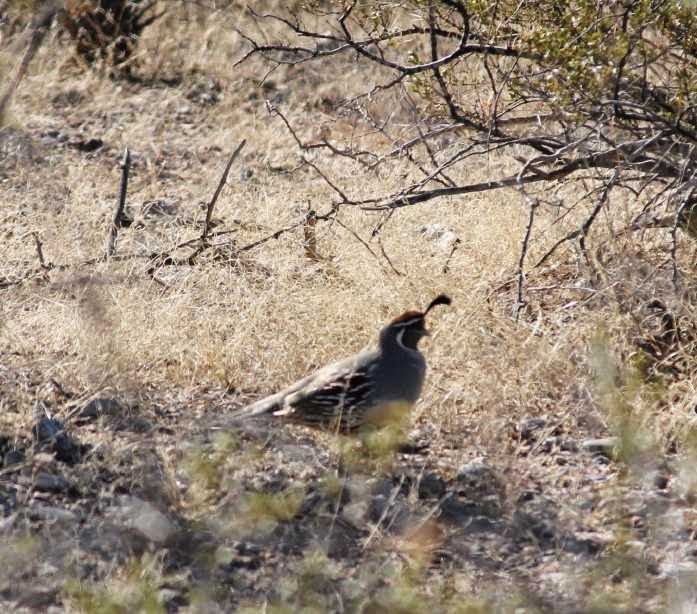 Right at our site, a Gambel's Quail. They move quickly in a group. 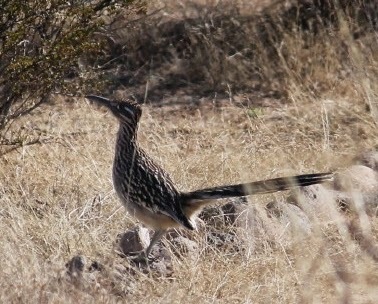 It is not easy to grab a picture of the Roadrunner. Very wary and quickly jumps into the brush or takes off like lightning. 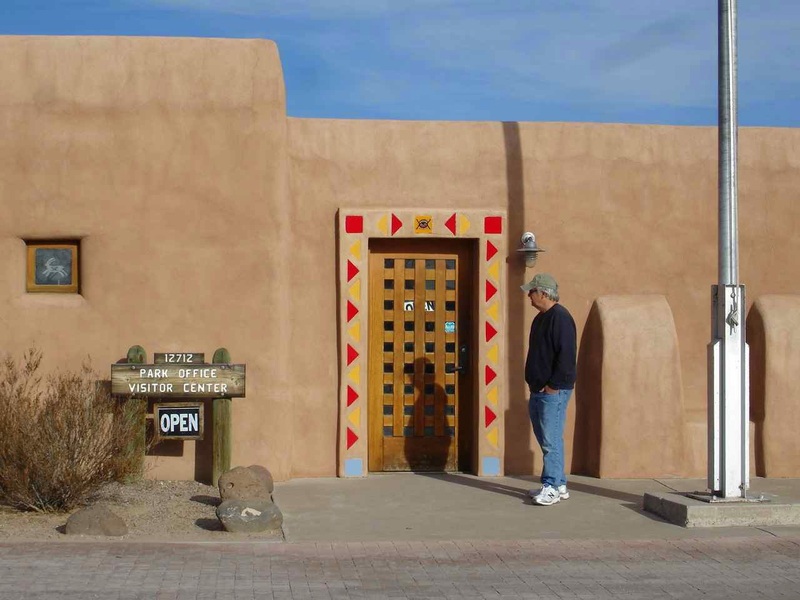 The state park office is of New Mexico heritage style. We even like the door. 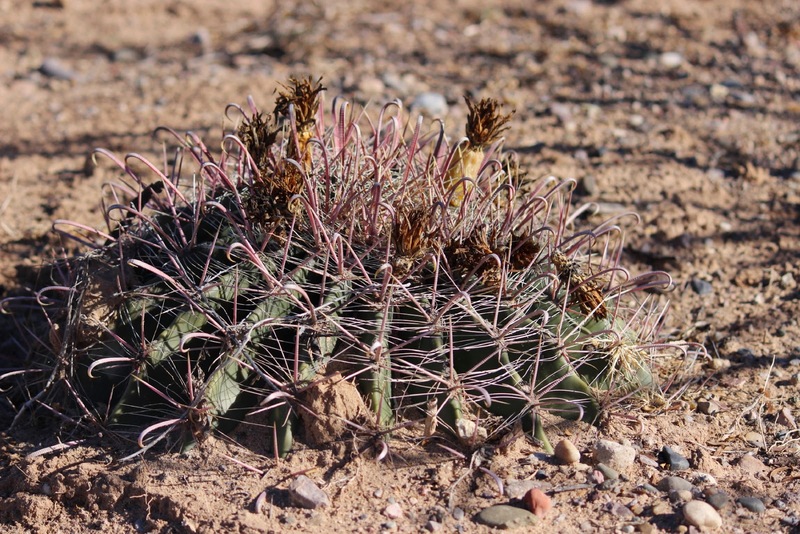 Jan and I will end this one with a picture of a fishhook cactus. You do not want to test those hooks!! !